Here at Guttering Repairs Ltd we are able to offer a guttering repair and cleaning service to commercial and domestic clients across Feltham. If you have broken or damaged guttering on your home or business property, give us a call; we are always happy to arrange for a guttering repair specialist to come and give you a free no obligation quote on the guttering and any repairs needed. 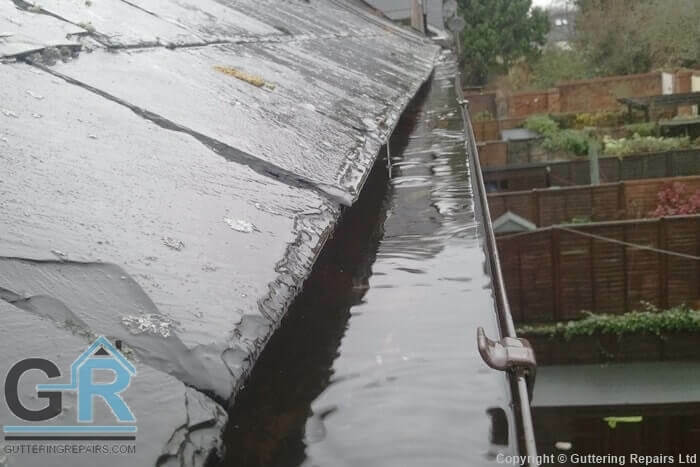 When rain gutters become blocked by leaves, petals, buds, dirt, twigs and debris and are then left this can cause serious damage to your guttering which can result in water damage to your property which encourages mould growth and damp. If guttering repair work is not completed your property could become damaged and this could be extremely costly to repair. This is why it is recommended that you speak to us to arrange yearly or twice yearly guttering maintenance so guttering repair work can be completed quickly and cost effectively. We can offer guttering repair experts to homes and properties across Feltham, from bungalows to six storey flats and even commercial and industrial buildings too. Whatever your roof gutter repair needs in Feltham, we have the gutter repair experts to get the job done. Here at Guttering Repairs Ltd we have more than five years of experience in guttering repairs and cleaning, we are a family run company and we really care about our customers. We offer all of our customers the best possible service, the highest level of customer care and excellent workmanship at extremely competitive prices. Fill in the request a quote form and we can contact you with the details of an experienced guttering repair tradesman in Feltham or call us directly and we can arrange for a guttering repair specialist in Feltham to give you a no obligation quote for free. If you have any roofing or guttering repair queries feel free to call us, our friendly team are always happy to offer advice and guidance.